Financial – Jim Brosnan reported that the bank balance at the end of November was $3,461.76. Giving Tuesday, the Tuesday after Thanksgiving, was not very successful as of today’s meeting. Announcements – We are still waiting for a quote from our insurance company for our annual premium. Walter Plank suggested that, next summer, he may be able to give a seminar about fishing in the reservoir, plus a “casting” workshop. At that time he will also install the fishing line deposit boxes. Mark Kotkin will check to see what we need to rough up the ground for the wild flower installation. We may be able to borrow a “power rake” from Bear Mountain Park. Recreational Trails Program Grant – With NY State DOT wanting signed plans for the two bridges, The Taconic Region decided to pull those projects from the grant and fund them internally. National Heritage Grant – Some of the funds in this grant will be used for interpretative signs in the park. It requires a 50/50 match. Trail to Viewland Drive – The steps giving access to the trail to Viewland Drive have been completed, and a total of 127 hours were spent on this project by members of Friends of FDR Park and volunteers on the trail building crew of the New York New Jersey Trail Conference. Next Sunday, the 13th, at 12:30 p.m., work will continue working on the extension towards the first of the two bridges to be built in the spring. 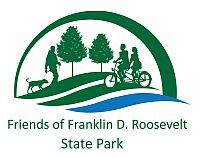 Park Manager’s Minute – Brian will be leaving FDR Park, at the end of December. He was promoted to Facilities Manager at Saratoga Spa State Park, in Saratoga Springs. A new park manager has been hired. Everyone had a chance to say good words and funny stories to Brian. He then thanked everybody for the support he experienced over the years, and the help of the Friends group in taking care of the park. This was his “dream job” and he will always cherish his experiences. The Friends gave him a digital photo frame with several pictures of FDR Park already downloaded on it. Anwer Qureishi had prepared a CD with more pictures pertaining to the park for Brian to add later. We adjourned at 8:15 for our party to say goodbye to Brian Strasavich. Note: there will be two meetings in January: January 13th, at 7:30 p.m., in the Katonah Library, where Jane Daniels was invited to speak about her book Walkable Westchester, and the following week, Wednesday the 20th, at 7:30 p.m., in the rear of the park office, at the Route 202 park entrance, to hold the annual election of the directors.